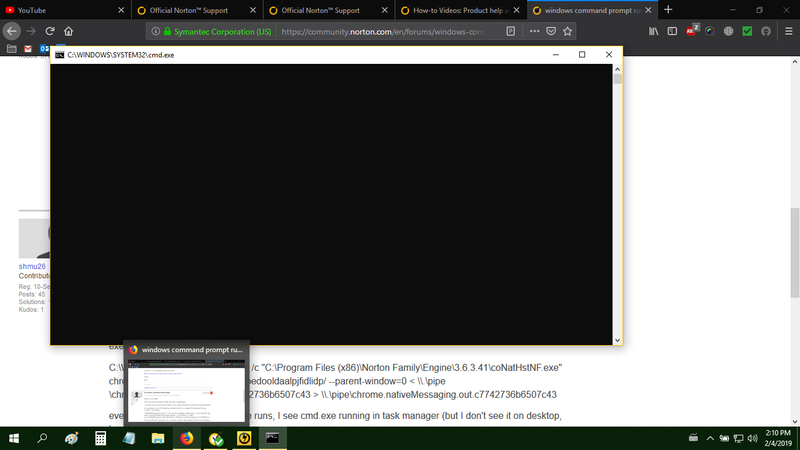 Hello i am having a cmd problem since i have installed norton. It has been one week, i have waited because i thought, it may worked itself out but unfortunately problem is going on. Sometimes i saw that "Access denied" words on cmd window. Sometimes it's seen for 10-20 seconds sometime 3-5 minutes. Firstly i thought it is about an updating but it starts to slow down my pc also. Can you please help? Are you running Windows using an admin account? Did you have another security product installed before installing Norton? If so, did you fully remove it using the removal utility for that product.? If you use Windows 8/8.1 or 10, there can be an issue with the Windows Fast Startup feature.. See more information here. We usually recommend tuning off the Windows Fast Startup feature as it can cause issues with fully updating some software packages, including Norton. As cmd is a Windows process, you can try scanning your Windows installations for issues. Click on Start and type CMD in the search box. Right click on cmd.exe and click on Run as Administrator. Type 'sfc /scannow' without the quotes. This will check your Windows installation and try to correct any errors it finds. All: From what I can see in the screenshot Norton Family appears in text below under which Chrome is also referenced. Possibly some form of malware Norton has missed within a browser. From an admin account, as Peterweb suggested, download and run Malwarebytes. Check for anything that may be quarantined.